Here at Diabetes Flashpoints, we’ve often discussed the potential merits — and drawbacks — of low-carb diets. While some people with diabetes tout the benefits of going low-carb for better blood glucose control, the most active debate about these diets concerns their role in weight loss. Some scientists and researchers believe that carbohydrates — and the insulin your body releases when you eat them (unless you have Type 1 diabetes) — play a unique role in how your body burns or stores energy, while others dispute this notion. A recent study was designed to test the theory that carbohydrate restriction leads to increased weight loss, compared with a higher-carb, low-fat diet containing the same number of calories. Published earlier this month in The American Journal of Clinical Nutrition, the study had 17 overweight or obese male participants between the ages of 18 and 50. The participants spent the first four weeks of the study following a high-carb, calorie-controlled diet, and the next four weeks following a low-carb diet with the same number of calories. Each participant was told to ride a bicycle for 90 minutes each day, and on two days of each week, each was confined to a metabolic chamber where extremely precise measurements about how their body expends energy could be taken. The entire eight weeks were spent in a controlled setting. As noted in a MedPage Today article on the study, participants lost weight and body fat throughout the eight weeks — not surprising, given that they were burning about 300 more calories each day than they consumed. During the low-carb phase of the study, participants burned an average of about 57 or 151 more calories (depending on how this was measured) each day than during the high-carb phase. 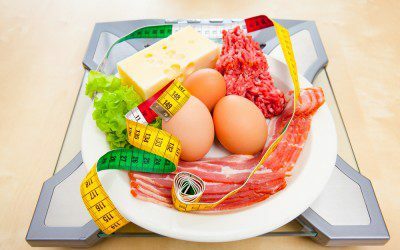 But even with this extra loss of calories, the rate of body fat loss slowed down during the low-carb phase. Instead of stored fat, the body was mostly burning lean body mass and protein. Assuming that the results of this small study hold up in further, larger studies, what’s your take on the results — do you think it’s promising that low-carb diets apparently lead to more calories being burned? Or is it troubling that the calories burned come more from lean mass and less from fat, compared with a higher-carb diet with the same number of calories? Have you found limiting carbohydrates to be helpful in losing weight in your own life, or are other approaches better? Do you think the study’s controlled setting could have failed to measure certain benefits of a low-carb diet, such as making people want to eat less? Leave a comment below!